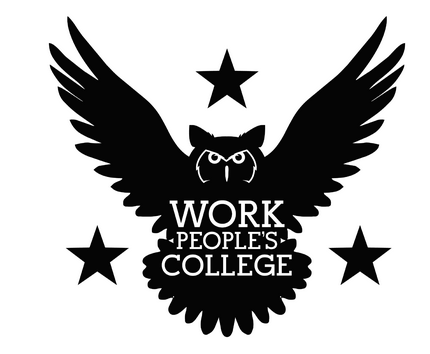 A reportback of the IWW's Work Peoples College, a week long workshop and training event meant to spread skills and share experiences within the union. The IWW is famous for its radical and inspiring history, and so an oftenheard criticism of Wobblies is that we are “stuck in the past,” that 80 years have passed and we are now little more than a “Joe Hill Appreciation Society.” This argument discredits the value of lessons learned from past organizers, both recent and historical. The past has a lot to teach us, as does the present. None of us are so smart that we can’t learn from what other workers have tried before us. The important part in moving forward is what we do with that knowledge to adapt to present labor conditions. This past summer, Wobblies revived something from our history and updated it to fit our times. That something was the Work People’s College (WPC). The WPC traces its roots to a Lutheran college founded in 1907 for Finnish immigrants in Duluth, Minn. As some years passed, socialists influenced the school, and eventually it was renamed the Work People’s College. By 1921, following the split in the socialist movement along electoral and direct action lines, the WPC became associated with the IWW, which used it to promote theoretical study and the spread of organizational skills. Wobblies came to the WPC to learn about industrial unionism and the skills needed to be a delegate and public speaker. There were also English classes, readings of Karl Marx and various IWW members, as well as explanations of the structure and methods of the union. The college continued, even as our membership declined, all the way until 1941 when it finally closed shop. In 2006, the Twin Cities IWW began reviving the WPC in a smaller way. This began as a series of workshops, mainly in the form of one-day educational events and presentations. While originally focused on attracting and building up organizers in the Twin Cities and upper Midwest, the project eventually developed into the idea and manifestation of a six-day event, returning to the woods of the former WPC in northern Minnesota. This time the event was aimed at wider audience: Wobblies throughout the United States and Canada. This past summer, for the first time in 71 years, this more ambitious form of the WPC took place. From June 30 until July 5, approximately 100 IWW members from across the United State and Canada came to Mesaba Co-op Park. These campgrounds, near Hibbing, Minn., were originally founded by Finnish immigrant communists in the 1930s. In a region where the historical IWW led miners and timber workers in strikes a hundred years ago, fellow workers attended workshops and were able to have conversations with other members across the union. Conversations on the IWW’s present and future stemmed beyond workshops to less structured exchanges at the campgrounds. A lake with a small beach, canoes and fishing allowed folks to socialize. All three meals of the day were cooked from scratch by rotating committees of volunteers. Additionally, the separate but simultaneous Junior Wobblies camp allowed children and young adults to be a part of the week in a way that benefited everyone in attendance. The WPC ran a wide spectrum of workshops in unique areas. Examples of workshops that focused on some practical skills included: Branch Administration, Running a Good Meeting/Committee, Industrial Research I & II, Graphic Design Basics, three courses on Media, and Picket Training. Workshops also shared knowledge of history and theory, including Understanding Capitalism and the History of Labor in North America. Areas of experience in the IWW still in development were also explored, such as Strike Support, Dual-Card Organizing and Power & Privilege on the Committee and Mediation, among others. Sarah Rose from the St. Louis GMB said her favorite workshop was Building New Members. “We discussed formalizing programs to build up the general membership, being strategic and growing solidarity,” she said. “The bulk of the conversation was directed into tactics a branch can use to build up new members. This included asking for goals from people who are interested in joining, creating a new member orientation, having regular socials and showing solidarity with each other by the use of time banks, skill shares and gift circles,” said Sarah Rose. “The most important reason the workshop was so enlightening was that the focus was on ways to be strategic while still building up members. Ways to do this include building a branch social map and building the branch on class-consciousness rather than on friendship,” she added. Brianna from the Kansas City GMB said that the WPC allowed her to be inspired by the shared struggles of herself and her fellow workers. “Seeing so many people that I have only known online and hearing the many stories of struggle, success and failure really reinforced my belief that each and every one of our contributions to each others’ struggles really does make a difference in the lives of workers who are not just workers, but human beings who face daily challenges, struggle to make life worth living, not just for themselves, but for all workers, and feel the same feelings of hope, remorse, joy and pain as myself. My actions or lack of action are part of what determines whether or not someone else’s life is improved and every life improved is a step toward a more humane society. What we do matters, sometimes in an abstract and long term way, and sometimes in a very immediate tactile way,” said Brianna. For some, the WPC was the first opportunity for those kinds of steps to be taken, as it was their chance to meet and talk to people outside of their branch or region who had been a part of well-known struggles at Starbucks, Jimmy John’s, and New York City warehouses, as well as those who had participated in recent events in Wisconsin and Oakland. “I moved to Minneapolis a month before the Work People’s College to lend an extra pair of hands. As someone with a history of working at an infoshop, and hosting skill shares and small-scale events, I figured there would be some way in which I could help out. Maybe some of the skills I developed in Lawrence, Kansas would be helpful? The learning curve during this time was pronounced and intimidating. It required that I ask a trillion questions to catch up. Who is this? What is this? How is this being done? And why? But in true IWW fashion, fellow workers were supportive and patient. They challenged bad ideas in constructive ways and encouraged me to run with the good ones. By doing so, I was pushed to a whole new level of organizing,” she said. Sarah Elizabeth knows both she and fellow organizers took a chance as she developed her leadership role for the pilot year of the WPC. “This happened with a lot of anxiety about failing and thinking that surely someone more experienced could do each task better than me. But I learned that often the ‘best’ person for a task is the one who will actually make sure it is done and not be afraid to ask for help. We are all teachers and students, specialists and generalists, leaders and workers. Working long nights through stress and unknowns created more than a weeklong intensive training in northern Minnesota; it built a lasting solidarity with other fellow workers, the type of solidarity that can only be built over collective struggle,” she said. The impact and after-effects of the WPC are still coming into view across the union. Some fellow workers across North America have had the opportunity to participate in building up the IWW’s presence while paying respects to its history, but the legacy of the WPC is not yet over. What will it take to organize fast food?